Eugene McGillicudy and Charlie Thomas Jones can’t wait to join Sunnyview’s eight-year-old soccer team. These superhero pals have no doubt that they will lead the team to victory. MI-TEE! 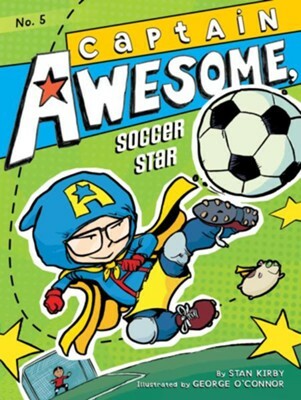 But when Captain Awesome’s (aka Eugene’s) soccer skills prove to be less than super and his dad decides to coach the team, Captain Awesome starts to wonder if the Sunnyview Megabytes have what it takes to defeat the Westville Kickers. With easy-to-read text and illustrations on almost every page, the Captain Awesome chapter books are perfect for beginning readers! Stan Kirby tied a beach towel around his neck and became Super Commander Beach Boy when he was six years old. When Stans not creating the awesome adventures of Captain Awesome, he loves reading comic books, eating okra, and hang gliding (but not at the same time). George OConnor is the creator of the New York Times bestselling graphic novel series Olympians, in addition to serving as the illustrator of the Captain Awesome series. He is also the author and illustrator of the picture books Kapow!, Ker-splash, and If I Had a Triceratops. He resides in his secret Brooklyn, New York, hideout, where he uses his amazing artistic powers to strike fear in the hearts of bad guys everywhere! I'm the author/artist and I want to review #5: Captain Awesome, Soccer Star.